This is an idea theft case based on the idea behind “Creed” the movie, a spinoff of the famous Rocky movies. 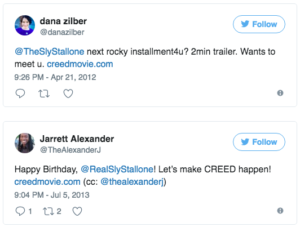 Jarrett Alexander alleged that he came up with the idea for Creed, drafted the screenplay, and put together a pitch reel that he initially posted on Vimeo and then on a separate website. He also alleged he circulated the idea and the pitch reel to various industry types, including those associated with the original Rocky movies. He also tried to raise awareness for the idea on social media by promoting the idea on Twitter. 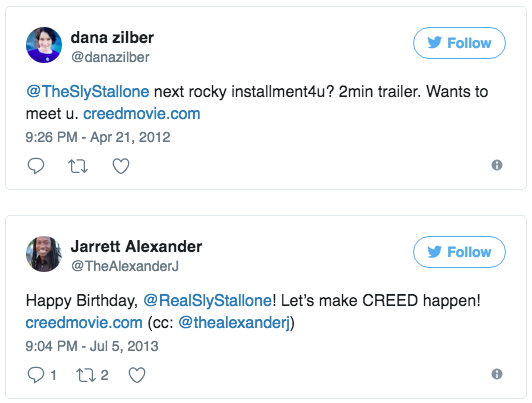 Plaintiff and his friends tweeted at The Rock (who is friends with Stallone), to Carl Weathers (who played Creed in the Rocky movies) and to Sylvester Stallone himself. The complaint did not allege that any recipients acknowledged the tweets or took action based on them. Sometime later, MGM and Stallone announced their plans to develop Creed, which plaintiff alleges bears thematic similarities to plaintiff’s own idea. Misappropriation of idea claim: the court says this tort is recognized in certain narrow situations and requires either confidentiality or a contractual promise. An idea itself is not protectible. Confidentiality is obviously not available given public dissemination of the idea. The court thus looks to the second possibility. while requiring an in person meeting for misappropriation of idea claim in the world of movie and television pitching may be unrealistic in light of communication and social media advancements, plaintiff’s theory of implied contract by tweet and by mass-mailing of the screenplay might turn mere idea submission into a free-for-all. Unjust enrichment claim: The court cites to similar flaws and dismisses his unjust enrichment claim. We haven’t seen many idea submission cases where an idea is submitted over social media. While in a totally different context, and a unilateral contract case, this case reminded me of the YouTube rewards case, where the court said a rewards offer broadcast on YouTube was an offer that could be accepted by performance: “A Reward Offer Still An Offer, Even if It’s Made on YouTube – Augstein v. Ryan Leslie“. The court recognizes all sorts of mischief that could be wrought by recognizing these types of claims absent some sort of acknowledgment from the defendant(s). It would have been interesting to see what the result would have been if Carl Weathers, the Rock, or Stallone responded to the tweets in some way (such as by faving or retweeting, or responding). A gesture such as that is probably innocuous and would not have moved the needle on this claim, but the absence of such a gesture made the case particularly easy. The court flagged that while an idea misappropriation claim is not recognizable without confidentiality or some contractual hook, standing on its own, it’s also preempted by copyright. This made me wonder whether plaintiff considered this route. Not that it would have been meritorious, but since the plaintiff asserted a slew of other claims you’d think he would have thrown it in as well. This case was a long shot at best, made intriguing only by the alleged similarities between plaintiff’s idea and the movie ultimately developed by Stallone & co.
1) I think the world would be a better place if we permanently eliminated any “idea submission” doctrines. I’m fine with other torts applying if the requisite elements are met, such as trade secrets, contract law or copyright law. However, a standalone “idea submission” doctrine is invariably unmeritorious–and pernicious.